This quick and easy side dish is a yummy addition to breakfast or dinner! I made these Sunday morning... I had mine with a side of scrambled eggs, and some yogurt with granola. I made my boyfriend an omelet with the potatoes, sausage, and cheese... he topped it off with sour cream and salsa. Wash potatoes, and cut into 1/4's. Leave the skin on. Put potatoes into a medium sized bowl. Add olive oil, salt and seasoning. You can be fairly generous with the seasoning. Stir well. 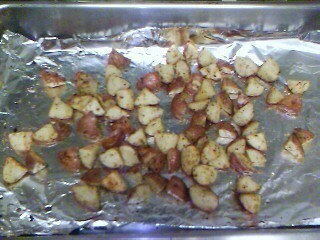 Pour potatoes onto a cookie sheet lined with tin foil, and cook for approximately 15 minutes at 425 degrees. 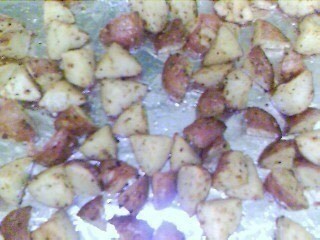 Flip potatoes, and cook an additional 15 minutes. They should be tender all the way through, and crispy on the outside. Add additional salt and seasoning to desired taste, and serve! I just made these this morning and mmm so yummy especially with rosemary leaves. mmm! i want them right now! i always use whatever's in my pantry but dill and some cayenne pepper is always tasty! where abouts in the supermarket did you find the seasoning? with the herbs? btw the omelet idea is great, must try!